That physical touch and engagement that I have with materials is the driving force in my practice. This week I’ve been back in the studio playing. I started to think about how sculpture and painting coincide; and how I can explore using ‘the wall’ as the base to work from. The making and material exploration is key to my practice and existence as a female artist. I emphasise the ‘female,’ this has become a focal point of contact as a sculptor. 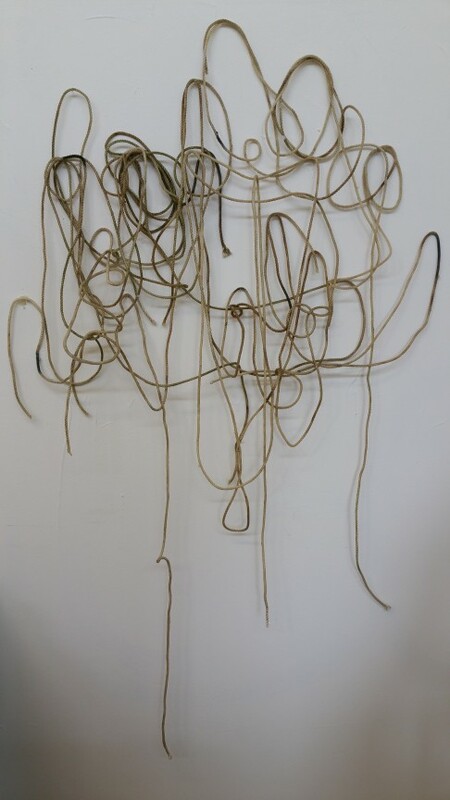 My research has led me to Eva Hesse and her distinct, fragile and playful approach to her work. The visibility of process in her art and methods of making she used to create such uncontrollable forms. Those organic qualities that had crossed over in my work previously came into play with this work using stained string and wax. I began soaking long pieces of string in the hot wax, draining the excess before draping onto the wall where pins were randomly placed for discreet support. 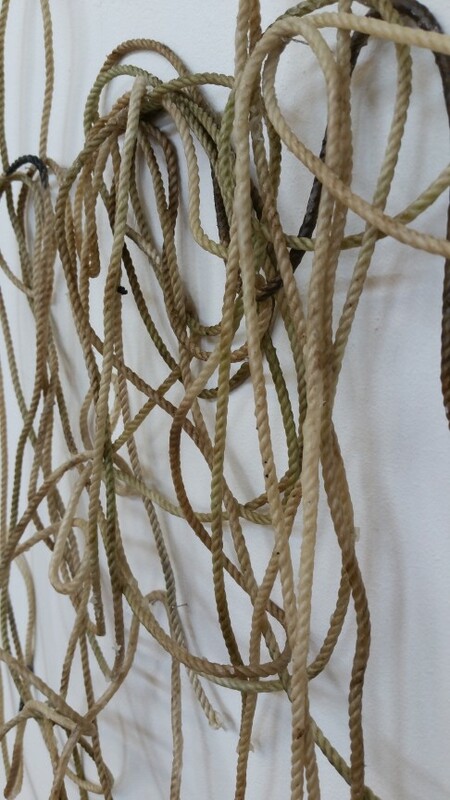 The clear wax enhanced the colour of the rope, once hardened in position the work possessed a painterly aesthetic. The work suggests a continuous line, a drawing, a form that suggests physical presence, flesh, a sense of control, the loss of control; the allowing of material to determine its form. This work has the potential for further development and play on how the form will develop; what is the work? What are the components? Why am I using these materials? The wax disturbs the texture of the rope, however forms a thin layer that allows the form to solidify and maintain its shape. When I start to play with materials or objects there is no initial plan or idea at first; I allow the material to discover its qualities and possibilities before my touch can begin to understand and create work. I had never thought of exploring three dimensional forms that incorporates a 2D aesthetic; this is a new area to explore and develop in the studio. 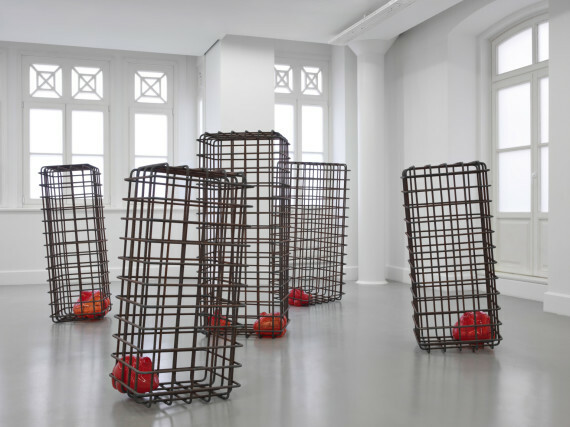 Mona Hatoum’s exhibition and artist talk at Tate Modern showcased a broad range of her practice and relationship with performance, sculpture and installation; how she addresses key themes and her choice of materials. What she focused on was how work doesn’t reveal clearly or directly and that the meaning of work can change with its context. Hatoum frequently deals with confrontational themes such as violence and oppression; she focuses on referencing the human body, its vulnerability and resilience. Her focus is now on sculpture and installation whereas her earlier works involve performances and video works. Looking closely at her works, there is a strong essence of confinement, composition and a phenomenology with materials; the exploring and juxta-positioning of materials to create jarring relationships. She discussed how a lot of her work is inspired by place, location and environment; I can relate to that quality and how work can be a continuous circle when working out of a studio space. One of my favourite sculptural pieces is Cellules, mild steel cages that contain blown red glass forms that are trapped yet still look as if they are emerging from their cages. The simplicity of form, use of grid lines and colour explore minimalism, the physical approach to making and that jarring of materials that explore texture. Maps are an abiding motif for Hatoum and Present Tense that was in the exhibition explores the raw, organic use of materials where 2,400 blocks of olive oil soap from the town Nablus, North of Jerusalem sits on the gallery floor in a grid format. The surface has been embedded with tiny red beads that depict the map of the 1993 Oslo peace agreement between Israel and Palestine. For me the work has such a strong presence and sense of the artists touch, all blocks vary in size and shade of colour which presents a human presence and context. This piece was difficult to conserve, the difficulties of preserving the quality of the soap as the surface would mottle over time were apparent and a continuous battle. The exhibition gave an insight to her way of thinking, after researching her work, to have the opportunity to engage with it in the flesh was jaw dropping. The scale, colour, material choice, forms and early performance documentation was instantly mesmerizing and the show was beautifully curated. She discussed how space should be used as a source of inspiration; an extension, expansion and intuitive way of producing work. Works can stay in the mind long before they become materialized. 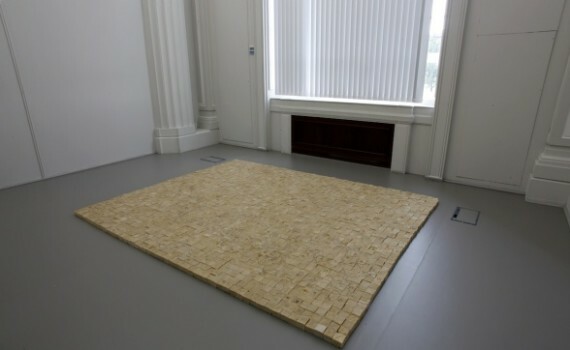 There continues to be intense connotations in her work, a strong essence and abstraction of materials. One of the questions that was asked was how she deals with identity; Hatoum responded with how identity is constantly changing and that she doesn’t focus precisely on ‘identity’ as it is instantly stereotyped. This past week has become very much focused on the what, how and why? What is my context? How can I achieve this? Why am I using the materials/objects in my work? I’ve been researching artists Martin Creed, Robert Morris, Sol Lewitt and Meret Oppenheim; focusing on the idea of changing the function of materials and objects and how my work seems to have developed a strong connection between industry and the domestic. The materials such as balloons, steel, soil that I’m currently working with relate to everyday life, you can recognise them but my aim is to challenge their function and everyday purpose. What’s interesting for me is when art becomes a live event instead of a display of static objects; life and movement becomes a focal point in the consciousness of the work. I’ve mentioned the connection and focus on industry and domestic; my tutorial with Holly Davey we discussed how my relationship and observation of certain materials in relation to their context. How do I read their context? My use of steel and focus on form, scale and weight lead me to the discovery of how this material becomes a domestic material; my connection and history with steel stems from my childhood, surroundings and this sense of comfort. This is a complete contrast to how the viewer would read or connect with the work; we relate steel to industry, its masculine aesthetic and a male dominated environment. This has continued to be a reoccurring question and point of contact in my practice. As a female sculptor using ‘masculine’ associated materials on a large scale, challenging that notion of weight and gravity. 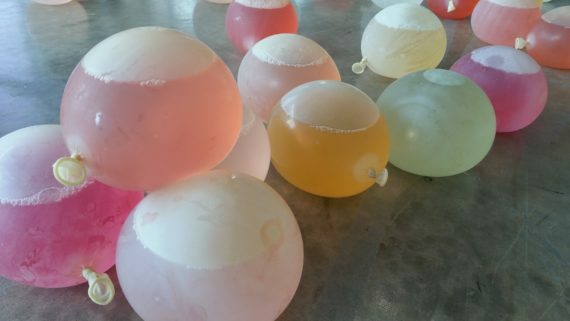 Another focus has now become the change of function of materials and how I can connect, play and disrupt their function. 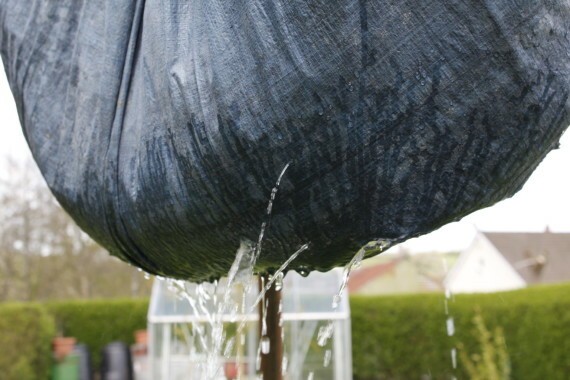 I’ve started using balloons, sheets of tarpaulin and water that suspend from 10ft high steel tripods; but in what context do I want this work to sit? Inside or outside? This decision will change their visual aesthetic and appearance. There’s a clear essence of play in the work and how I work, play and explore materials. 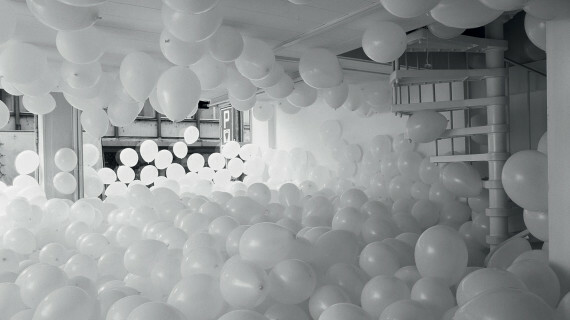 The use of balloons in particular questions play and colour; Creed’s work and his aesthetic with his use of the balloons disrupts space and allows the audience to engage with a physical experience. How do I wish the viewer to experience the work? Does these need to be both a visual and physical experience? The height and scale of the work will be a challenge for me and hopefully the viewer; the juxtaposition of materials emerging in an open space will explore play, form, colour, and weight. 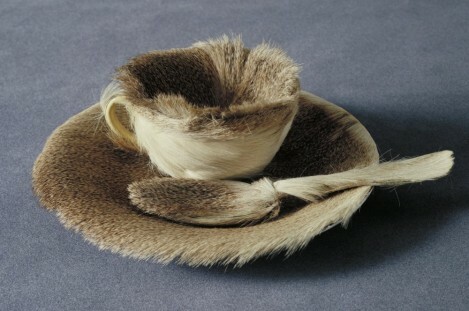 Oppenheim’s work explores the juxtaposition of everyday objects, which were often domestic into sculptural assemblages. Her use of fur relates back to my use of human hair and how I seem to refer back to organic elements in my work; the soil, grass and lard. These materials challenge traditional sculptural materials and form an expansive context that questions the familiar and unfamiliar, the organic and manmade and the phenomenology of materials. Over the next few weeks a continuation of exploring materials and the jarring of relationships will emerge from experimental works in the studio; I need to form an understanding and a conclusion of what materials are overall successful to suspend from these steel tripods. Referring back to my previous work, the use of materials, objects and processes; my aim is to abstract and expand their qualities and possibilities to uncover both a visual and physical experience. Steel has been such a versatile material for me to work with; the scale, weight and colour of the work. How can I change the function of these materials? Connecting material to domestic and industry; what do these materials communicate to us? The last few weeks have involved very little making but more reading and trying to form a basis and understanding of my practice. My interested lie in purely material and objects manipulation and defining space they coexist in. I began to wonder whether my work was focuses on responding to a space but this has never been a focal point when making and I’m still unsure whether it’s important or even relevant. That’s not to say site and location shouldn’t be taken into account when making work; however this can restrict decisions. As part of this module, a critical study essay is required that somehow relates or is relevant to my practice. I began working with metal to construct frames and instantly had an urge to enquire into this material further. The sculptor Richard Serra who creates sculptures on such a monumental scale offers both a physical and visual experience; these qualities intrigued me; the invention of form and how this has developed over the years. “Does Sculpture have a language?” How can one answer this? What is interesting reading about Serra is that he explores a material and the process of that material to the extreme; his work banishes those pictorial qualities and focuses on forming a relationship with the movement through space. This has reinforced an interest in steel; how I can begin exploring weight, balance and form by enquiring and testing materials and their transition through process. Another artist that creeps into my research is female sculptor Phyllida Barlow; she explains ‘I need time to understand what I’ve done, and that is an odd paradox,’ I can completely relate to how she works as this has been a reoccurring problem for me with my practice. I tend to make and continue to make work and then I soon realise that I’m left with ‘stuff’ and then the WHY? gets asked. I want the work to remain minimalistic; minimal form that engages with various materials to explore weight, balance and colour. Colour had never been anything to consider or of any importance in my previous work; however this quality will become an area to explore and consider further moving forward. I decided to make a visit to Michael Beutler’s ‘Pump House’ at Spike Island, Bristol. The installation is a real experience and captures the space and redefines scale using industrial and various materials that explore form, surface and texture. What initially caught my attention was his use of bold colour and how playful the work read, the structural build and mass of material that surrounded, filled and interacted with the space defined its environment. This led me to play and explore certain elements from my previous work that could uncover possible encounters with various materials and objects. 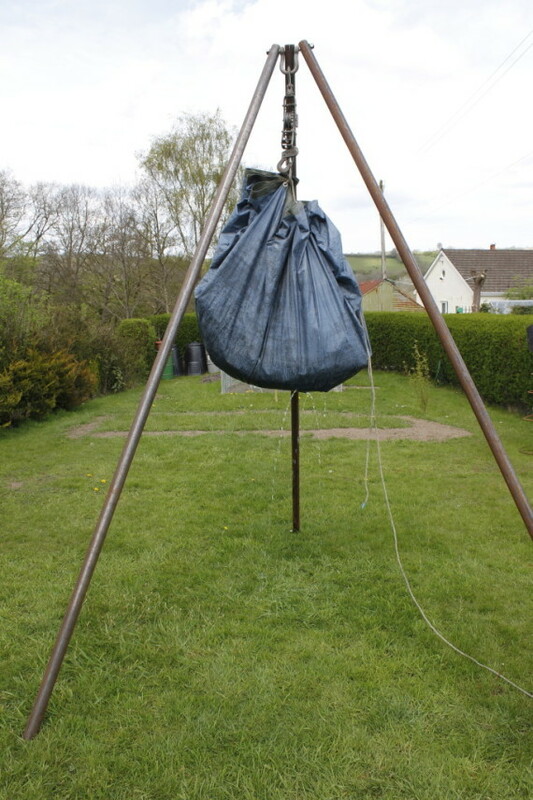 I have built a steel tripod to test suspension, weight and gravity; using tarpaulin and building merchants bags that are filled with water hanging from engine hoists. Scale is a crucial factor with this work; what I found difficult to achieve was a perfect circle form which needs further time to develop. What also comes into the work is site and the environment the work will inhabit and the space it will define. Due to the industrial nature and qualities, a warehouse or open indoor space would suit the aesthetic. I had previously used balloons with nylon tights so thought about playing with a steel structure and balloons; referring again to form, weight and colour. 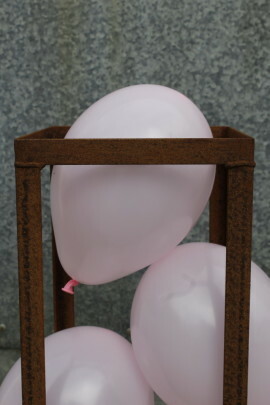 The problems that occurred was that the balloons fell through the steel frame; I then thought of using reinforcement mesh to construct a cubic shape frame that will contain the balloons. 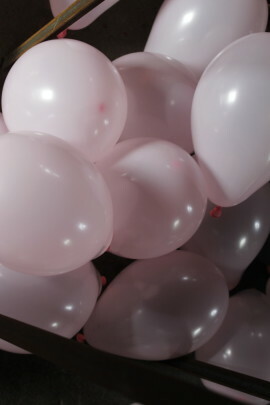 What’s an interesting quality with the balloons is how they will loose air or burst over time; therefore the work will take on a performative quality and will allow both a physical and visual experience.